The Xperia XZ2 might be the first Sony Android phone that turns heads since the Xperia Z. Here I was, holding a 5.7-inch 18:9 phone with slim bezels and a curved, all-glass design. If it wasn’t for the name on on the front, I never would have guessed it was a Sony phone, and to be honest, I didn’t want to put it down. 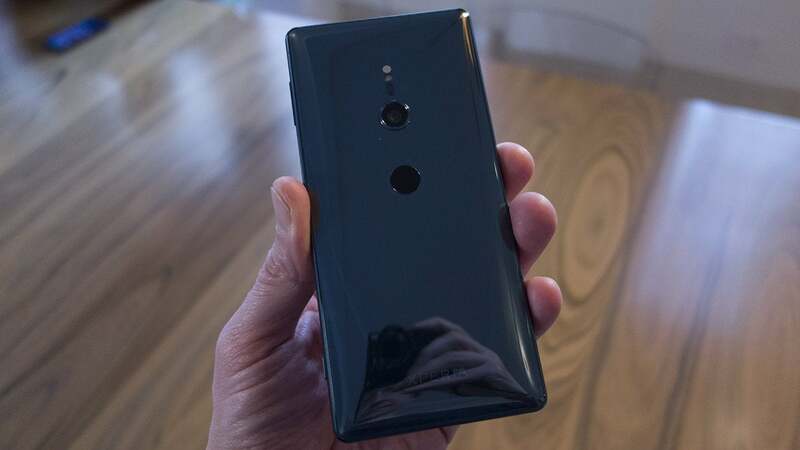 But the very best thing about the Xperia XZ2 is on the back of the phone. I’m not talking about the camera—which is still a single lens rather than the flagship-standard dual setup. I’m talking about something that’s taken for granted on nearly every other 2018 smartphone: a fingerprint sensor. For the first time, a Sony flagship phone will ship with a real-deal fingerprint sensor (rather than a weird side-scanning one). 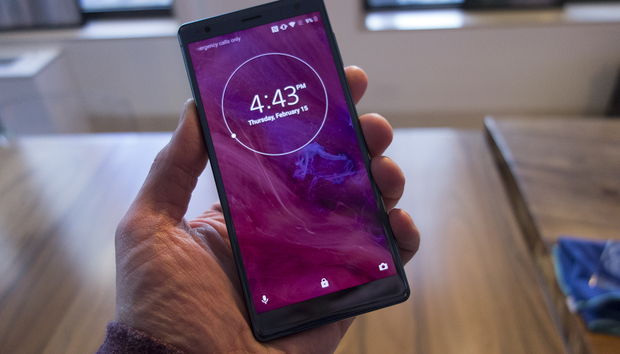 And it’ll work in the U.S.
Fingerprint sensors aren’t generally on the list of things I get excited about when checking out a new phone, but in the case of the Xperia XZ2, it was the first thing I tested during my brief hands-on. I registered my fingerprint, unlocked a few times, and tried different grips. I can report that it worked as well as any other smartphone fingerprint sensor I’ve used and it’s in a good position in the middle of the case. And it just might be the thing that makes Sony phones relevant again. Around the fingerprint sensor, Sony has built a downright beautiful phone, with curved edges all around and a respectable screen-to-body ratio. The 5.7-inch 18:9 HDR screen isn’t OLED, but first impressions are still strong, with crisp, clear images and colors that pop. Once you get over the surprise that the Sony Xperia XZ2 has a fingerprint sensor, you’ll appreciate its exquisite beauty. The bezels around the screen aren’t quite as thin as the Galaxy S9’s but they’re a dramatic improvement over last year’s XZ1, which stubbornly clung to a outdated design. Quite frankly, the most noticeable difference between the XZ2 and the Pixel 2 XL or OnePlus 5T is the square corners on the screen, but they hardly detract from the design. Around the back, the Xperia XZ2 is draped in reflective glass, which looks gorgeous until the inevitable smudges appear. There’s an attractive symmetry, with the camera, flash, and fingerprint sensor all in alignment down the middle. 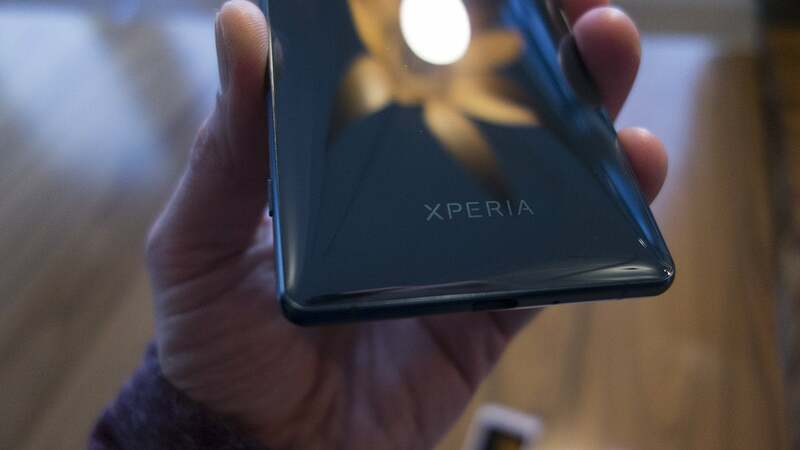 Indeed, it’s clear that Sony has put considerable energy into making the XZ2 a good-looking device. It doesn’t break any new ground in the design department, but it won’t look stale next to the S9s and Pixel 2 XLs of the world either, and that’s important. Like the S9, the Sony Xperia XZ2 will use the Snapdragon 845 chip, giving it bragging rights as the fastest around. But speed isn’t Sony’s game with the XZ2. The phone aims to be the ultimate device for Sony’s bread-and-butter: audio, video, and photography. Nope, there’s no headphone jack on the Zperia XZ2. The immersive screen is capable of displaying HDR content, but you don’t need to be watching an HDR show to enjoy the superior picture. Sony will automatically up-convert SDR content to HDR quality on the XZ2, and the results I saw were subtly improved without blowing out the colors too much. However, it’s probably something purists will want to turn off, so hopefully Sony builds a toggle into the display settings. Sony has fitted the XZ2 with stereo speakers buoyed by its S-Force Front Surround, which emulates 360-degree surround sound with just a pair of speakers. I wasn’t able to fully test it in the room I was in, but the phone certainly sounded loud and full despite a fair amount of ambient noise. 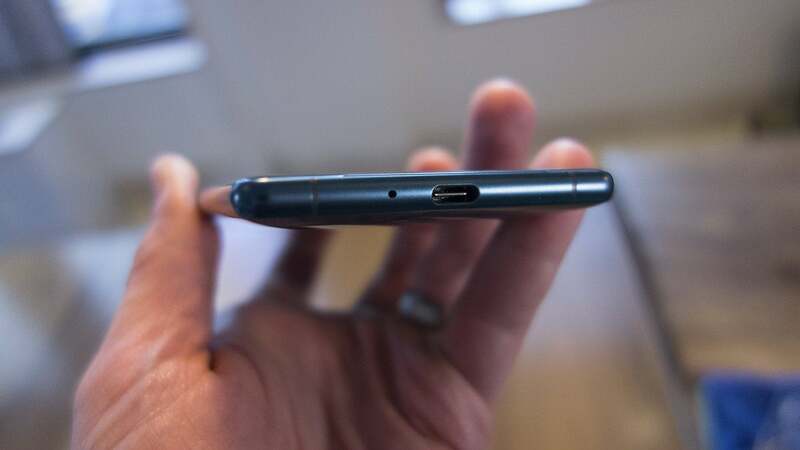 If you don’t want to blast sound through your phone’s speaker, you’ll need to use USB-C or Bluetooth headphones, since the XZ2 doesn’t have a headphone jack. However, there will be a USB-C-to-3.5-mm adapter in the box, and the phone will include support for Qualcomm’s aptX HD Bluetooth codec for superior streaming audio. To enhance the sound even further, the XZ2 includes Sony’s proprietary Dynamic Vibration System, which uses an algorithm to add haptics to movies and games that will shake your phone at the proper moments. I didn’t get a chance to see...er, feel it in action, but Sony says it will act something like DualShock in its PlayStation controllers, shaking the phone during intense scenes. As with all the Xperia phones that came before, Sony is placing a huge emphasis on photography with the XZ2. The phone has a single lens on the back, but it’s an impressive 19MP, f/1.8 camera capable of recording video in 4K HDR. The Sony Xperia XZ2 reflects light...and attracts fingerprints. Sony has brought over the super 960fps slo-mo recording it debuted on the Xperia XZ Premium (though it records in Full HD here), as well as its Predictive Capture tech that snaps a series of photos before and after you hit the shutter button. But the most interesting thing about the XZ2’s camera is what’s going on behind the scenes: For the first time, Sony is using Qualcomm’s Spectrum 280 image signal processor to handle photo processing. It speaks highly of Qualcomm’s chip that Sony feels the Snapdragon 845’s ISP is capable of capturing images and videos up to Sony’s high standards. Qualcomm says phones deploying its ISP will regularly top 100 on the DxOMark chart, a feat that hasn’t been achieved by any handset. I wasn’t able to properly test the XZ2’s camera during my brief time with it, but my expectations are about as high as they can get. Alongside the XZ2, Sony is also releasing the XZ2 Compact, which, as its name suggests, is a smaller version of the XZ2. The screen is just 5 inches, but still Full HD, HDR-capable, with an 18:9 ratio. The back is made of a composite material rather than glass, so there’s no wireless charging. Despite its smaller size, the XZ2 Compact has a similar aesthetic to the XZ2 but feels a good deal chunkier than its big brother. Still, for its size, it’s nice to get premium specs, including the same high-end camera and chip as the full-sized XZ2. Both sizes of the XZ2 will come in four colors—black, silver, green, and pink—and go on sale this spring, but Sony hasn’t said how much they will cost. If the price is right, though, they could put Sony back on the smartphone map.